“The time for lamentation is over. 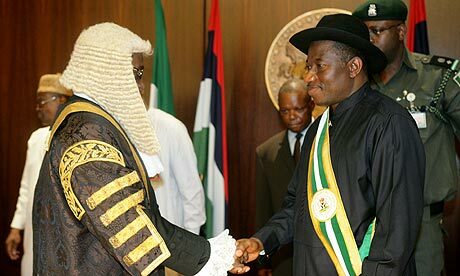 This is the era of transformation” were some of Nigeria’s President Goodluck Jonathan’s historic words as he unveiled his transformation agenda in his inaugural speech on 29th May 2011. In this “journey of transforming Nigeria”, Jonathan made a litany of promises which include fighting for improved medical care, “first class education”, electricity, affordable public transport system, provision of jobs , fighting the scourge of corruption, reforming the industrial sector and many other mouth-watering promises. As Nigerians and the international community eagerly look forward to the new administration tackling head on, the myriad developmental challenges bedevilling the giant of Africa and fulfilment of some of these promises, such optimism has been tainted with disappointment not only from a largely uninspiring Cabinet comprising of the old guard, but the recent preoccupation of the administration with a constitutional amendment bill proposing single-term tenure for the president and state governors. The proposed bill according to the Presidency would reduce “…the acrimony which the issue of re-election every four years generates”, the money wasted on elections and the unrest and violence that trails elections in Nigeria. Given that this is one of the last policy options Nigerians and even the keen observers from the international community expect, Jonathan is certainly testing the waters of his popularity and of his good luck. The wide opprobrium and opposition this proposal has met is hinged on what Nigerians perceive to be a misplacement of priority. With the onerous task ahead of the new administration in addressing Nigeria’s many, many problems which Mr. President has made many, many promises to address, Nigerians are astounded that of all these, it is the term limit of elected officials which incidentally neither featured in that lengthy, Obama-esque inaugural speech nor the pre and post elections campaign rallies, that is his administration’s immediate priority, while burning issues like insecurity and tackling the radical Boko Haram sect or even settling the minimum wage issue with the Civil Servants apparently take a backseat. It is no wonder that the proposed bill has met with angry responses from individuals, groups and the civil society. As the presidential spokesperson even said, some responses were downright abusive. While many have called it an unnecessary distraction and a sinister plot, the Nigerian Bar Association (NBA) calls it “divisive and self serving”, the opposition Action Congress of Nigeria (ACN) calls it “patently fraudulent, deceptively self-serving and a terrible misadventure” and the Conference of Nigerian Political Parties (CNPP) describes it as “diversionary”. These harsh phrases are euphemisms of what many Nigerians really feel about this issue. With the exception of religion and ethnicity, one other thing that rouses intense emotion and passion in Nigerians having been long abused by decades of bad governance and bad leadership, is any issue that remotely smacks of an attempt by a leader to extend his stay in power. This is not something taken lightly as many previous Nigerian leaders from the military governments of Gowon, Babangida and Abacha to the civilian administration of Shagari and Obasanjo, have tried to use fair, not-so-fair and foul means to perpetuate themselves in power, it is no surprise that many Nigerians are vehemently kicking against this. On the African continent as well, the very uninspiring sit-tight record of other African leaders such as Cameroun’s Paul Biya who has been in power since 1982, Zimbabwe’s Robert Mugabe in power since 1980 and Uganda’s Yoweri Museveni since 1986; others like Bongo of Gabon and Eyadema of Togo who died in office after decades in power; recent attempts by Mammadou Tandja of Niger and most recently, Senegal’s Abdoulaye Wade’s attempt at constitutional amendment for a third term does not help matters either. Despite assurances from the Presidency that the President would not be a direct beneficiary if the bill gets passed into law as it would become effective from 2015 after his current term, and that it is yet to be sent to the National Assembly as “consultations” are still being made to work-out the details, Nigerians are very sceptical nevertheless. So far nothing stops the President from contesting for a fresh term of 6 years from 2015, just as Senegal’s Wade and his supporters are now arguing that he can run for a third term because he was elected before the constitution amendment on term limits was effected. In addition, Jonathan is reported to have said that the 4-year mandate is insufficient to make meaningful developmental progress and is also reported to have expressed his admiration for “Saudi Arabian and old Soviet practice where some ministers were in office for 30 to 40 years”. The truth is even if there is no sinister or covert motive behind this proposal, the President’s unguarded utterances are not helping matters either. The Soviet Union collapsed under its unsustainable communist-authoritarian model over 20 years ago and no country in the world today has that model of a political system with the rare exception of North Korea which is a pariah state anyways. Even Cuba is opening up its economy. While Saudi-Arabia is an absolute monarchy which narrowly escaped the current tide of Arab spring through an adroit mixture of suppression and social reforms to calm the tide of protests. Even if such a system works for Saudi Arabia, the socio-economic and political milieu is very different from Nigeria’s. While certain regimes in some developing countries who provided transformative leadership and were responsible for the most dramatic changes were in power for decades, more than 4-5 years of the typical democratic tenure such as Lee Kuan Yew who, during his three-decade rule saw Singapore’s transition from a developing nation to one of the most developed countries in Asia with a steady growth rate of 6.7% . Similarly, Indonesia’s General Suharto’s 32-year rule between 1967 and 1998 oversaw the economic growth and industrialization of Indonesia with improved health, education and living standards of its peoples. These leaders were benevolent dictators, as they implemented progressive social policies which lifted millions of their people out of poverty and that is where they derived their legitimacy from. As their legitimacy and popularity inevitably declined, they had to cave in to popular demands and step down. That is exactly what is now happening in the Middle East. However, with the dominance of democracy in the 21st century, this form of government is no longer in vogue. With democracy, legitimacy is not only tied to performance, but to accountability whose abuse can be checkmated by the electorate during elections period with the threat of withdrawal of mandate. Eliminating that vital check-point will give Nigerian politicians notorious for their corruption, impunity and non-accountability until elections come around the corner, a leeway to act as they please. Now that the President has tested the waters and rather than finding it warm, has found it chillingly cold, it is hoped that he will shelve this proposal aside and eventually dump it in the dustbin of history while he actually hits the ground of transformative leadership, sprinting. For the enormous challenges ahead of his administration require all the speed he can muster. And while he’s at it, it would pay to consider some words he himself uttered in his inaugural speech: “…Nigeria can only be transformed if we all play our parts with commitment and sincerity”. if it were in a country where real democracy is practice ;President Jonathan would’t have been the President today.Because,competative elections is not democracy. Election is just a vehicle to power.Unfortunately,we in Africa the only way to power is violence,intimidation,assersination votes buying, riging and conspiracy.A part from Mexico which country that practising liberal democracy choses for six year single term?